The Flanks liposuction will give your waist a well toned and slim effect at Alluremedspa. Love handle will give your curves a slender look and you can wear anything of your choice that will flaunt your figure. The method of liposuction by using ultrasound causes much less damages to the tissues and other areas of the body. A t the start of the Liposuction, a ultrasound probe is made through the small incision that needs the treating. The anesthesia and saline substances are infused through the incision to break down the fats. The saline substances create soundwaves in the body to to remove the excess fats. A small cannula is inserted through the incision to suction out the fats in the body. The untrasound method is much safer than the traditional liposuction method. There is no wear and tear of tissues, blood vessels, and veins. 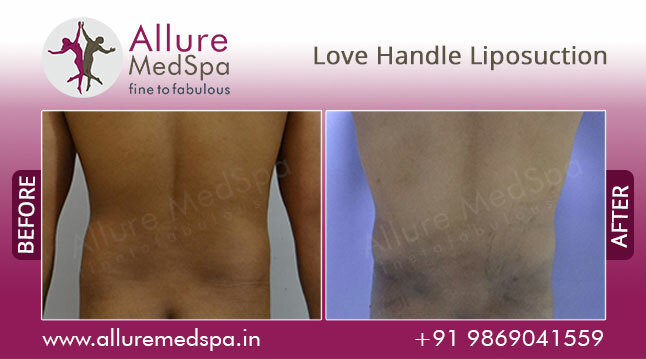 The ultrasound love handle liposuction reaches and removes fats from even difficult areas of the body at Liposuction Center- Alluremedspa..
One can consult Dr. Milan Doshi to proceed with the love handle liposuction. Dr. Doshi will determine your body type, your body mass index and suggest the type of liposuction that will be suitable for you. Allure MedSpa which is renowned for its state-of-the-art internationally acclaimed services,offers affordable and cost effective cosmetic procedures. To know more about the cost of your procedure request a consult by filling the form below. Your consultation is your chance to ask questions about Flanks Liposuction studies and put your mind at rest. Your surgeon will be able to offer you full explanations and answers to all of your queries.